If there's one country I'm just a wee bit obsessed with, it's England. Ever since my first trip there in college with my English Department, I've gotten the British Bug pretty bad. It's the beacon to my old soul, and every time I get the chance to visit, there's just a feeling so at home when I'm eating some chips, watching the meadows fly by while on the train, and standing upon the very ground Jane Austen walked. With my Bit of Ivory Photography hat on, I have the incredible opportunity to be there right now as you're reading this to help a photog friend shoot a wedding (in a castle! ), enjoy everything British, meet up with wedding pro friends and bloggers to get creative. As a native Brit, Elizabeth of Bridal Musings knows her curries. She loves "the bustling Brick Lane in East London, which is arguably home to some of the best curry houses in England! (As well as an awesome vintage market frequented by hipsters at weekends!) We have a thriving Indian community in England so alongside fish and chips, Chicken Tikka Masala has been adopted as one of our national dishes!" "For restaurant snobs, I always recommend Dinner by Heston Blumenthal at the Mandarin Oriental Hyde Park. The menu is inspired by historic British gastronomy going back to the Tudor times. The curious meat fruit (chicken liver mousse made to look like a clementine) is the eatery's signature dish, but I love the salmon cured in Earl Grey tea and the sambocade, a goat's milk cheesecake with elderflower, for dessert." Great for food allergies (specifically gluten!) and ambiance, The George Inn is a huge favorite memory of ours. Settled right outside of Bath, this place has indoor and outdoor seating. Their Eton Mess cheesecake dessert is the best, according to the cheesecake maestro himself: my husband! For the pub experience, this one is a winner. Ariana of Hey Wedding Lady passionately recommends this gorgeous landscape area! "Absolutely, hands down, go to Dartmoor in Devon and have a cream tea with scones and Devonshire clotted cream! The moors are gorgeous, and I'm drooling just thinking about the cream." "Portobello Market in Notting Hill Gate is well worth a visit for it's ye olde antiques market on a Saturday for an eclectic, colourful and bohemian atmosphere. If you're a bit of a magpie, head to Hirst Antiques at the very top of Portobello road. This tiny vintage jewellery shop is an absolute treasure trove! With prices ranging from £30-£300 (approx. $40-$400), this is a place to find heirlooms as opposed to getting a quick, sparkly hit. On my last visit, I bought the most gorgeous pair of Art Deco emerald drop earrings for £40 (approx. $70), and I'd wear them everyday if I could!" Known for its natural hot springs and Georgian architecture and history (Jane Austen! ), Bath was once the place to be for socialites, respectable families, and the upper class back in its 18th century hey day. Nowadays, it's a bustling popular tourist spot that hosts the Jane Austen Centre (I can write an entire post on that! ), tons of spa and general relaxation getaways, and awesome shopping spots. And about an hour north, you can drive or hop a bus to the legendary Stonehenge! "Visit The Ritz for a traditional and luxurious English afternoon tea - just be sure to book well in advance (I'd recommend 2 months to be safe) and adhere to the formal dress code. They're pretty strict! Fortnum & Mason (just down the road) also has a wonderful tea room steeped in history but with a slightly more relaxed dress code and shorter waiting times to book a table." This place stole my heart when we stayed here. Combe Grove Manor is exactly what it sounds like: an 18th Century country house turned hotel and is surrounded by acres of private gardens and woodland. Breakfast was served in the main house -- which the staff was also accommodating for food allergies -- and it was just such a great experience. It's a short taxi ride from the train station and very easy to get back into the main town centre. If you're an old soul like I am, this will be heaven. Downton fans, look no further. You can stay on property where Downtown Abbey is filmed! While it's not the actual estate, you'll stay on property at the London Lodge. For obvious reasons, it books up over a year's time, so you'll want to factor that planning ahead of time. A fabulous local-to-London wedding blog with not just oodles of pretty wedding inspiration, but London Bride indirectly showcases other ideas of places to visit around town. 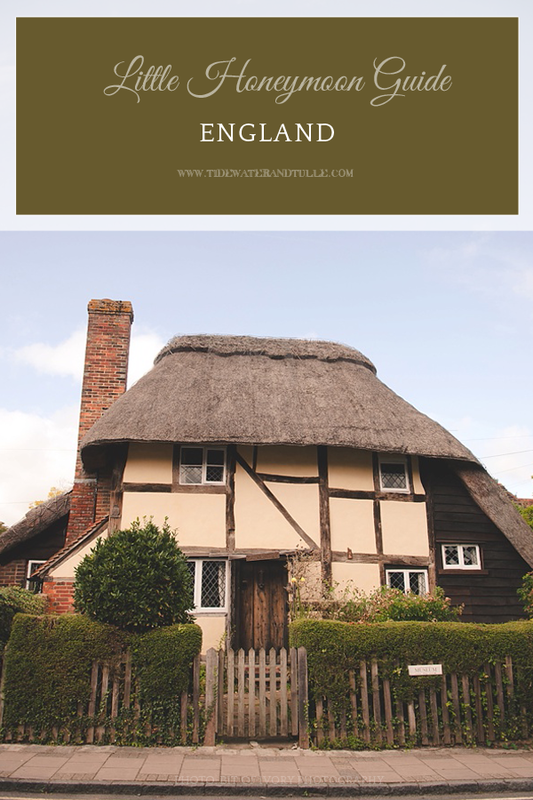 Covering all over England, English Wedding has beautiful imagery from coast to coast showcasing gorgeous venues that is sure to make any Anglophile's heart go pitter pat. Photo by Bit of Ivory Photography.